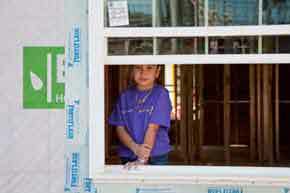 Fort Worth, Texas—Trinity Habitat for Humanity of Fort Worth, Texas, provides low-income families with newly constructed or remodeled homes. The organization serves four counties, and has helped 885 families since its inception. Samantha Miller, senior director of development, was struggling to raise sufficient funds for the organization. They hosted special events and made numerous individual asks, but their approach lacked organization. When Miller learned about Benevon she was intrigued by the comprehensive nature of the model. "Benevon puts it in such a streamlined structure," she told board members. Gaining board support, Miller and her team began what has now been a five-year journey with Benevon. Miller speaks with hindsight when discussing her organization's experience with Benevon. Though she admits the first two years were more of a challenge, as team members grew accustomed to the model, Miller credits Benevon training sessions with keeping up morale. "The two-day workshops are really the key to the model," she notes. "Every year the training session totally re-energizes our team. We're so motivated by the time we leave that we feel we can take on anything." That has included constructing a Point of Entry tour, called a "Habitour," and hosting Ask Events. Team members have also taken on individual roles, each one championing a different task. Miller says that during the third year, team members truly began to adapt to the ways of the model. "It really became the culture of our organization," she says. "Now it just rolls off of everyone's tongues." The Ambassador concept has been especially helpful for Miller and her team. "When we found out about Ambassadors, it was like a light bulb. It transformed how we fill our Habitours. Instead of just three people inviting others to come on a Habitour, we have twenty. Suddenly, the burden isn't just on you." Miller says that Trinity Habitat for Humanity now uses Benevon as a way to gain familiarity with potential board members. "One of the biggest benefits we've seen from using Benevon is the quality of board members we've been able to recruit. We plug people we're considering as board members into our Benevon team. They can start as Table Captains, become Ambassadors, before joining the board. That way we can see, is this person a doer or a talker? Are they going to be great working board members?" Miller was particularly impressed by one board member who accompanied her on an ask and displayed great passion for the organization when conversing with the potential donor. 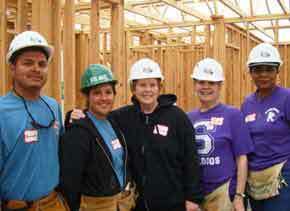 Trinity Habitat for Humanity also knows the value of Free Feel-Good Cultivation Events. One event that donors enjoy is the executive director lunch, during which three to five donors are invited to tour the organization's warehouse and engage informally with the executive director, Gage Yager, hearing about successes and challenges and offering their feedback about the organization. 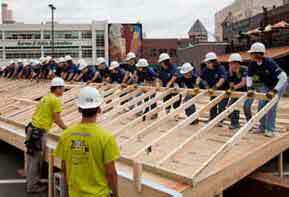 To date, Trinity Habitat for Humanity has raised $1.3 million attributable to the Benevon Model. As she looks to the future, Miller remains committed to achieving the organization's goals. She and her team plan to continue to increase their individual donor base and their number of Habitour attendees. They also hope to launch a neighborhood revitalization program to improve the quality of life in entire communities—beyond solely providing housing. "It's a structured system, and we've got it down now," she says. "Now it's just a matter of tweaking it, and asking, 'How do we make it better each time?'"